We are a leading Supplier of LT PVC XLPE Power Control Cable based in India. 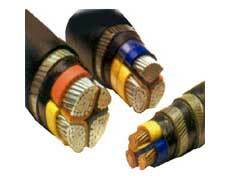 These LT PVC XLPE Power Control Cables are procured from trusted vendors in the industry. These LT PVC XLPE Power Control Cables are largely used in different industrial processes, owing to their high quality. Moreover, the clients can avail the LT PVC XLPE Power Control Cable offered by us in combinations of specifications as per IS 1554 Part I for cables upto 1100V and IS 1554 Part II for 3300V.